Elizabeth Loh is a Director in the firm’s health and welfare practice. 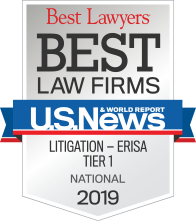 For over a decade, Elizabeth’s practice has focused on all aspects of health and welfare compliance (such as ERISA, HIPAA privacy and security, Internal Revenue Code Section 125 plans, COBRA, Medicare, USERRA, GINA, and HIPAA portability compliance). Most recently, Elizabeth has been active in assisting her clients navigate health care reform compliance. Elizabeth advises clients on plan design; drafting of plan documents; negotiating service provider agreements; handling DOL investigations; and benefits issues in mergers and acquisitions. Prior to joining Trucker Huss, Elizabeth worked as an employee benefits tax consultant and previously as an associate at a law firm where her practice focused on qualified retirement plan and executive compensation matters. 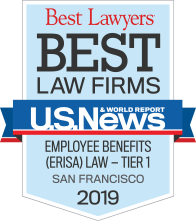 Elizabeth also worked for the U.S. Department of Labor Office of the Solicitor Plan Benefits Security Division, where she focused on ERISA fiduciary matters. Elizabeth lectures frequently on a variety of topics related to health care reform at various organizations such as Western Pension & Benefits Council. Health Care Reform Information Reporting – The Deadline for Filing Forms 1094-c and 1095-c Is Approaching. Are You Prepared? Wellness Programs-Overview of Laws Regulating Wellness Programs Including the Recently Issued Proposed EEOC Regulations!